Some of the hundreds who attended rally against the banks, including Flagstar, May 4, 2013. 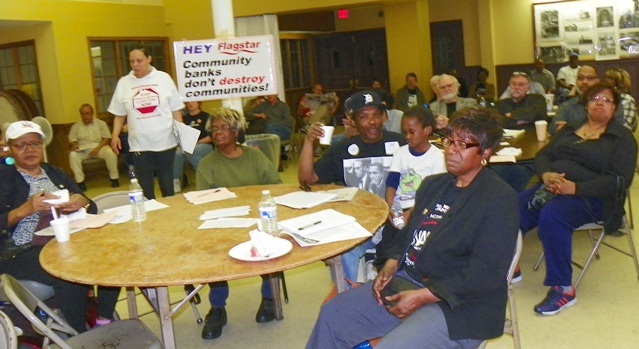 DETROIT – Organizers said May 4 that Detroit must mobilize immediately against the criminal global banks which have evicted 270,000 families, shut down half the city’s public schools, and devastated city services and jobs, charging $600 million last year alone in debt payments. Attorney Vanessa Fluker and city retiree Andrea English both spoke at the rally. Time is short. The people must rise, said speakers with the Moratorium NOW! 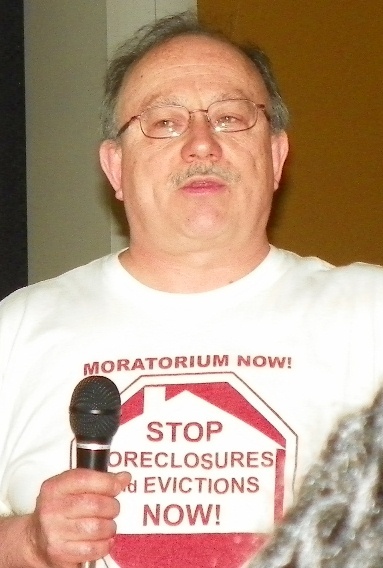 Coalition against Foreclosures, Evictions and Utility Shut-offs. 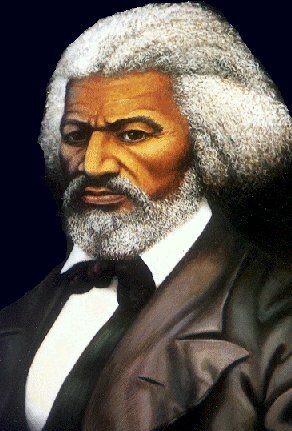 They demanded an immediate moratorium on payment of city and schools debt to the banks, and billions in reparations. 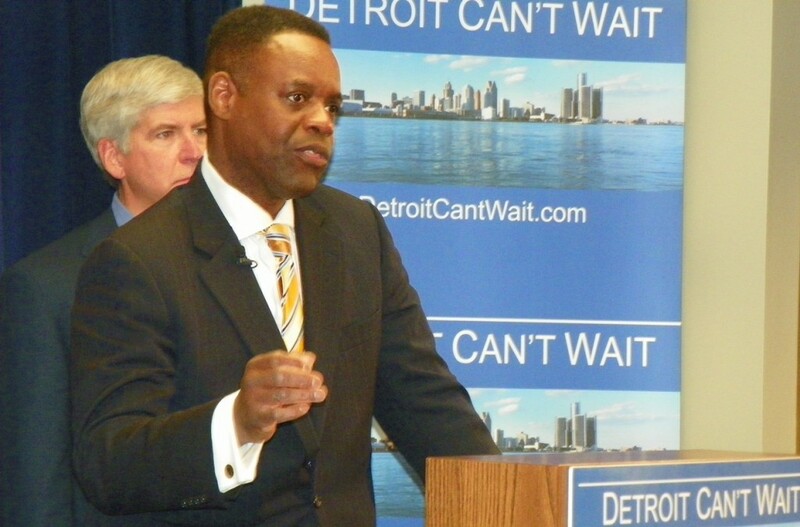 Detroit EM Kevyn Orr and his white shadow Gov. Rick Snyder. Nowling added that, “We’ve had a chance to pop the hood and look around now” since Michigan Governor Rick Snyder appointed Orr March 25. Moratorium NOW!, however, didn’t just “pop the hood.” Their analysis given at the May 4 meeting was based on 3,000 pages of the city’s debt instruments obtained through a Freedom of Information Act request. It is diametrically opposed to that likely to be given by Orr. 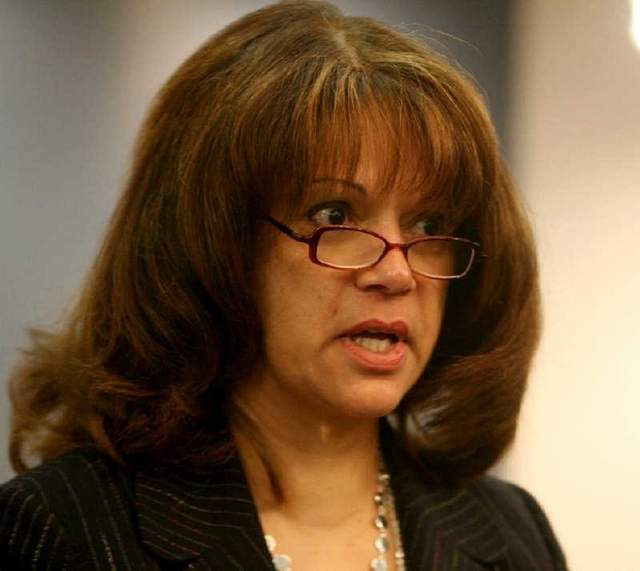 Orr’s law firm Jones Day, acting as Detroit’s “debt re-structuring” consultant, represents the very banks speakers said are responsible for the condition of the world’s largest Black majority city outside of Africa. 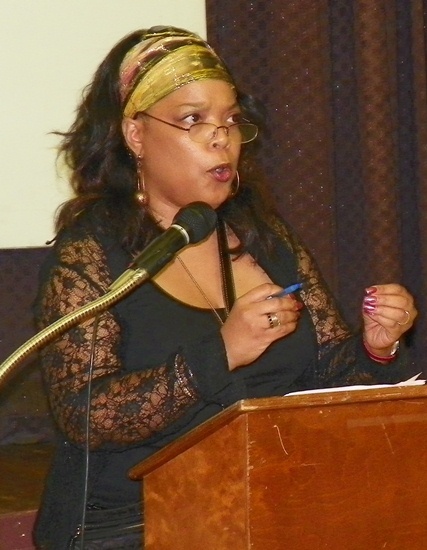 Nationally-known anti-foreclosure attorney Vanessa Fluker agreed. 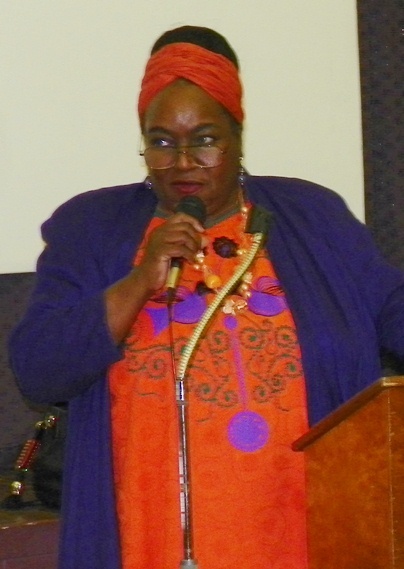 City Councilwoman JoAnn Watson said the wealth of the banks and corporations was built on the slave trade. Azikiwe said the crisis is global, leading to huge uprisings and general strikes by the people in Greece, Spain, Italy, France, Ireland and elsewhere in Europe. The LIBOR scandal, involving criminal interest-rate rigging by numerous global banks, began in Britain but soon spread across the ocean to the U.S., where the City of Baltimore and dozens of municipalities, pension funds and other debtors are suing the same banks Detroit owes money to. 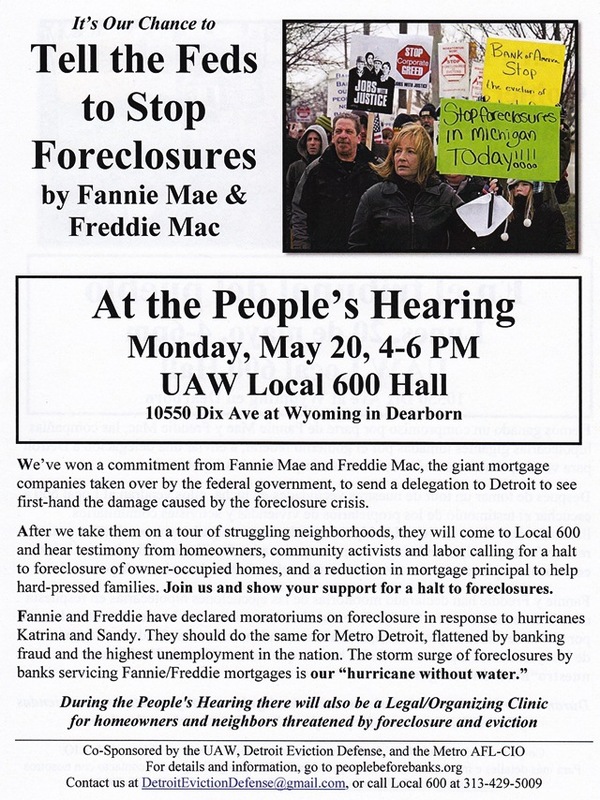 The slide show cited Detroit’s foreclosure crisis as the beginning of the current disaster, saying the banks targeted African-American and Latino communities for sub-prime loans, which were eight times more profitable than conventional loans. 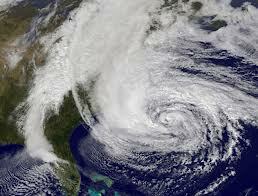 They used “massive fraud and deception in underwriting these loans,” Shane said. Detroit, which had the nation’s lowest foreclosure rate in 1996, had 67,000 foreclosures between 2005 and 2009 alone, eventually losing 237,500 people, nearly twice as many as New Orleans lost after Katrina. In 2012, Shane said, almost half of unpaid Wayne County taxes, $57 million, was owed by the banks on homes they had essentially stolen. Shane said the Senate Permanent Committee on Investigations, which Attorney Fluker testified in front of, found that Wall Street banks which Detroit owes money to engaged in a criminal conspiracy, in a massive report which he held up. 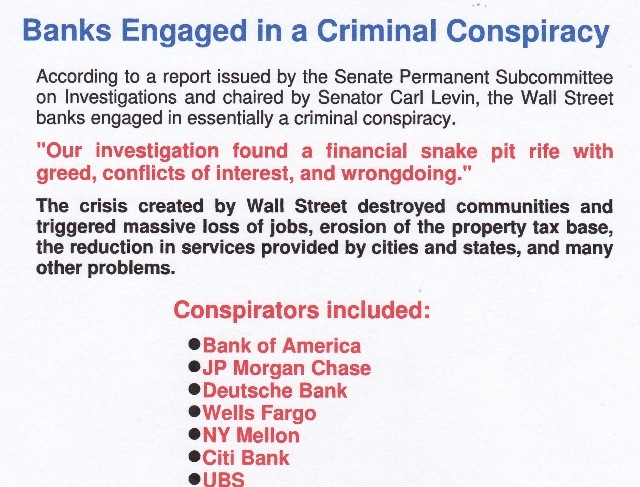 “Our investigation found a financial snake pit rife with greed, conflicts of interest, and wrongdoing,” the report said. Banks cited in the report included Bank of America, JP Morgan Chase, Deutsche Bank, Wells Fargo, NY Mellon, Citibank, and UBS. UBS in particular played a catastrophic role in Detroit’s economic decline. 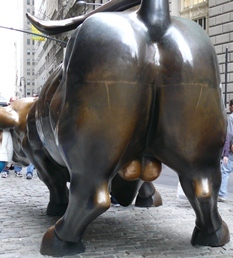 In 2005, representatives of Wall Street ratings agencies Standard and Poor’s and Fitch came to the City Council table in collusion with UBS to push a $1.5 BILLION pension obligation certificate debt on the city, meant to cover the city’s entire outstanding pension payments for 30 years. Despite loud protests from the pension boards, the unions, and the community, the Council eventually caved and voted unanimously for the deal. Shane noted that Detroit was only the second city to agree to such a proposal, but that many cities followed course afterwards. This reporter covered the session where the Council deliberated on the deal. Then Councilwoman Sharon McPhail, who later supported Kilpatrick. The market did go south in the great 2008 economic collapse, and Detroit defaulted on that debt several times, resulting in the banks getting ALL of the city’s casino income taxes and state revenue-sharing funds to vet, cut out their tons of flesh, and then return the scraps to the city. He said the Detroit Water and Sewerage Department, an enterprise agency whose bonds are backed by revenue, lost over $546 million terminating interest-rate swap agreements not related to the POC’s, profiting banks like JP Morgan Chase greatly. 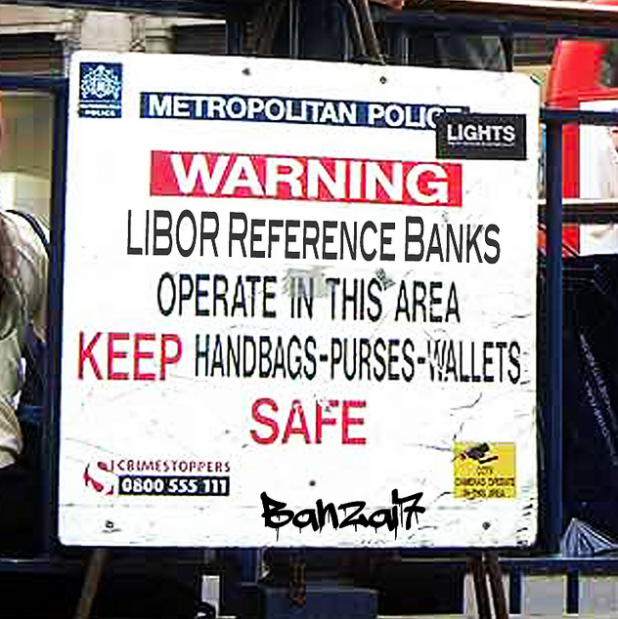 His slides showed that the International Swaps and Derivatives Association (ISDA), a trade organization of market participants, sets the standards for default and termination events, which result in raising the interest rates on outstanding debts to an additional nine percent over the “London Inter-bank Offered Rate” (LIBOR). 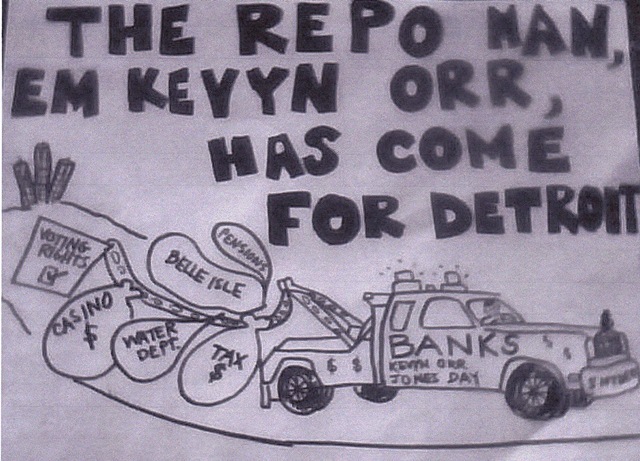 He concluded that the banks therefore dictated the appointment of Detroit EM Kevyn Orr, in order for them to get paid first, before the needs of the city’s people are met. The current EM act, Public Act 436, decrees that the chief duty of the EM is to ensure “The payment in full of the scheduled debt service requirements on all bonds, note and municipal securities of the local government, contract obligations in anticipation of which bonds, notes and municipal securities are issued, and all other uncontested legal obligations. He noted that Detroit Public Schools Emergency Manager Roy Roberts just left his job, because his mission was accomplished. DPS debt records show that it paid down its obligations to the banks by 2012-13 after closing half the district’s schools and laying off tens of thousands of workers. The previous year, it paid $523.8 million on its debt, or 89 percent of total per-pupil state aid. In the current year, that amount has declined to $63. 8 million, or 16 percent of state school aid, which has also declined with the student population. Shane concluded by calling for prosecution of the banks, a moratorium on debt payments, and “tens of billions of dollars” in reparations or restitution from the banks. While Kevyn Orr’s chief duty is to “re-structure the debt,” said attorney Jerome Goldberg at the end of the meeting, it is highly unlikely he will take a tough stance with the same banks his law firm, which is the city’s re-structuring consultant, represents. Instead, Hurricane Wall Street will be further visited on the people of Detroit and cities across the U.S.
Other speakers included, Rev. Bill Wylie-Kellerman of St. Peter’s Episcopal Church, Helen Moore of Keep the Vote No Takeover; Elena Herrada, elected DPS board member; Aliya Moore, Oakman School parent group chair, the Rev. Charles Williams, chair of the Michigan chapter of the National Action Network, and poets and performance artists B. Thomas and At Peace from the Conscious Coalition Collection. 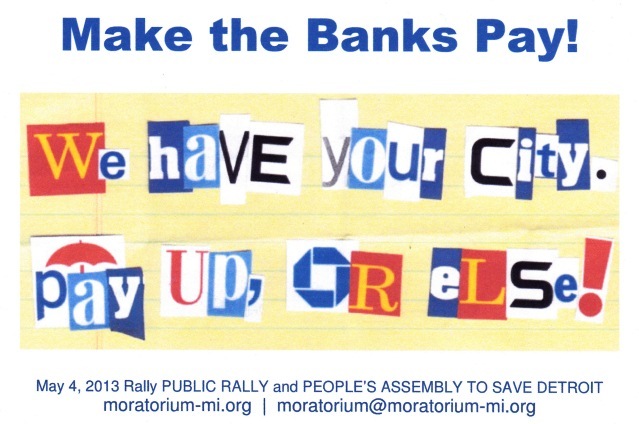 For more information, go to http://moratorium-mi.org/ and www.detroitdebtmoratorium.org. 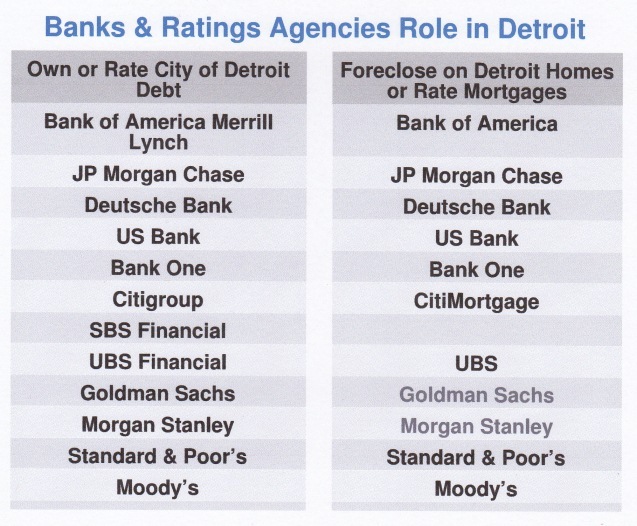 Download PDF of VOD stories on banks and Detroit at VOD Banks articles. Pingback: Voice of Detroit requests investigation by US Dept. 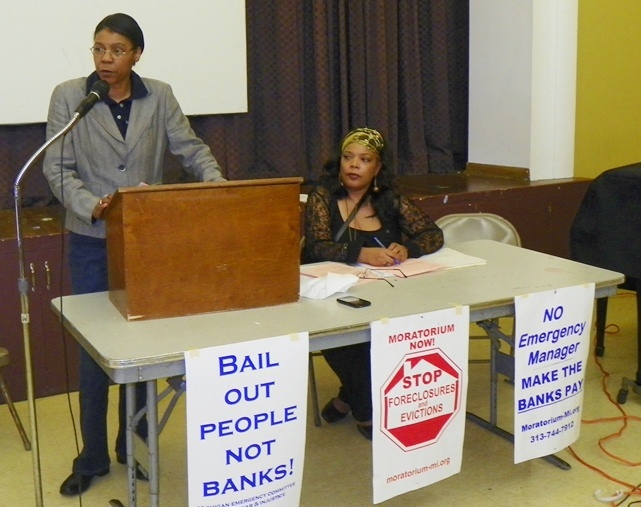 of Justice, no response yet » Cancel Detroit’s Debt To The Banks! This story was right on. I had to beg the bank to lend me the money to buy my house. Very degrading for me. They said my credit report was bad, just because I was a few months behind on some credit cards which I had to max out because I did not have enough money to pay for some other bills. Anyway I got the money at a higher interest rate then some other people got. Now after living here for 7 months I am 2 months behind on my mortgage payments. I wrote a letter to President Obama asking for help. Even told him I voted for him 4 times and he has not answered my letter. Bummer. What can I do with the credit card people and the bank people after me for all this money.. The bank should not be allowed to take my house and kick me out. HOUSING IS A RIGHT! !